The selection of camo hunting clothes on the market today is amazing. Materials used in their design can keep you warm in sub zero temperatures, keep you dry in a downpour, keep you from perspiring, eliminate odors, keep your movements quiet, provide concealment even in open country and much more. I’ll focus on a few main characteristics of hunting clothes to help the beginning bowhunter. We’ll review a handful of characteristics of camo hunting clothes including style/design, material, camo pattern and also technology. Camo hunting clothes are available in a number of styles. While none of us will win a fashion contest with our hunting clothes, you will need to decide among a few basic styles including pants and jacket sets, overalls, or bibs. I have experience with all of these styles and prefer pants with a jacket above the others for several reasons. Having two seperate pieces allows you to mix and match to meet the weather conditions and even the terrain you are hunting. For example, brown pants with a more open pattern on your jacket may be best when hunting from the ground. It can also help you stay more comfortable and allow easy addition or removal of layers of camo hunting clothes depending on the weather and your level of activity while hunting. Pants and jackets also allow you the greatest flexibility when shopping for hunting clothing as they are the most common styles. Bibs and coveralls often provide more warmth as a part of their design, but I have experienced some trouble getting into and out of treestands and when walking up steep grades due to the fit of these types of hunting clothes. You may also find that you will wear out the knees of you coveralls and have to discard the entire set rather than just replace a pair of pants. It is also tough to add or remove a layer or unzip to allow a bit of air flow should you become overheated while walking in to your stand. 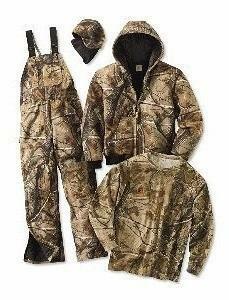 After style, the most important factor in selecting camo hunting clothes is the material they are made from. One of my favorite sets of camo hunting clothes is made from fleece. It provides very little in the way of insulation on cold days, but I bought it big enough so that I can layer up underneath. The thing I like most about the fleece is that is absolutely quiet no matter what I walk through or brush against. It also does a fair job of repelling moisture. You can find materials that are great insulators likeGoreTexor a similar material. These will often keep moisture out and will also work to wick moistrure away from your skin. This in turn helps keep you warmer for a longer period of time. These types of materials are more expensive. The beginning bowhunter may elect to purchase a fleece or even cotton/polyester fabric and simply add layers beneath to keep warm. There isn’t enough room here to go over every type of camo pattern on the market today. The choices for the bowhunter are endless which is great. This allows you to select the type of camo that helps you best hide in the terrain you’ll be hunting. What is often more critical than a branch or leaf design is the density and darkness or lightness of the pattern. There are leafy camo patterns that appear very dark and almost blend together into a dark form. If you’re not tucked into good cover in a treestand you will stick out like a sore thumb. You have probably seen some late season treestand hunters wear camo hunting clothes with a snow pattern even though there is no snow on the ground. The open pattern design and light colors help them sit in trees that have little cover other than leafless branches and sky behind them. Pay attention to the shades of color and the density of the pattern and go from there. Scent elimination and moisture control have got to be the biggest innovations in camo hunting clothes in recent years. Carbon lined hunting clothes allow you some flexibility with the wind as they are deisgned to help eliminate human odor as it leaves your body. There is much debate about the effectiveness of carbon lined hunting clothes. Personally, I think you should always hunt the wind first and if you can afford these high end hunting clothes as an insurance policy then all the better-but not an absolute need. The ability of hunting clothes to wick moisture away from your body has also become a standard for the next generation of hunting clothes. I really like this feature as I often overheat walking to my stand with a full head of steam. I would get to my stand and be a little sweated up. These hunting clothes do a great job of litteraly keeping you dry-within reason. Keep in mind that one of the main reasons we get cold on stand is because the moisture we generate walking in cools our skin as nature intended. So, remove the moisture and eliminate the chilling effect. This should provide the beginning bowhunter with some of the basics of camo hunting clothes. As a final tip, regardless of what you buy, be sure to turn your hunting clothes inside out and wash them on a gentle or hand wash cycle, cold water, in the washing machine. I use straight baking soda as a cleaner and scent eliminator and then hang them outside to dry to further eliminate scent. Washing your hunting clothes inside out on a gentle cylce will help keep the colors fresh and the material from wearing prematurely.